* price per person, based on 2 people sharing a room. Single supplement, if applicable: £725. Prices do not include flights. 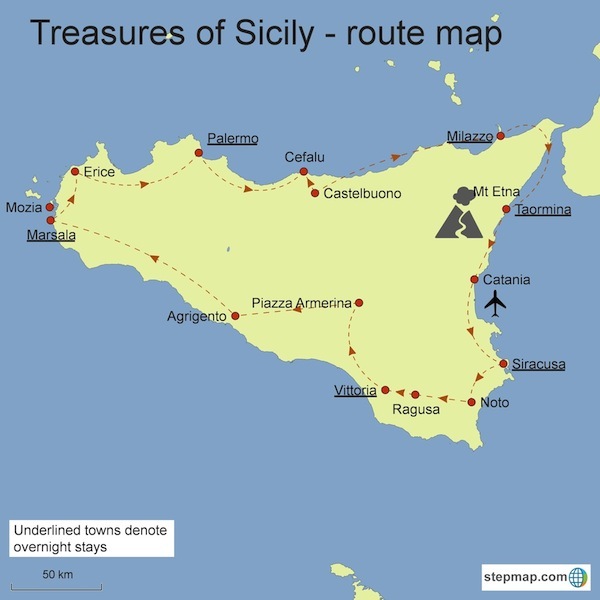 Fully guided tour of Sicily. We rendezvous at Catania airport in the afternoon and transfer by minibus on a short drive (1 hour) to our hotel on the island of Ortigia in Siracusa. Siracusa was one of the earliest Ancient Greek colonies of the Magna Graecia (the diaspora of Greek cities founded as trading outposts of their parent cities) but in the 5th century BC, it grew to be the most powerful city in the whole of Mediterranean. After a welcome aperitif, we eat a fine sea-food dinner in one of our favourite Siracusan trattorie. We start the day strolling through the streets of Ortigia – enjoying the vibrant food market, rubbing shoulders with Greek Mythology, contemplating temples and admiring stunning Baroque and Renaissance architecture and marvelling at Sicily’s most beautiful piazza. We visit the cathedral, once the temple of Athena, and thus arguably the oldest building in the world in use for Christian worship. We also have time to see the splendid painting of the Burial of Saint Lucy by Caravaggio in the church of the Badia di Santa Lucia. After lunch we visit one of the largest and best preserved of all Greek theatres in the whole of the Hellenic world and a remarkable cavern known as L’Orecchio di Dionisio – which, according to a legend started by Caravaggio no less, was used as a prison by the tyrant Dionysius and allowed him to eavesdrop on his captives. There is free time in the late afternoon – perhaps for visiting the archaeological museum (where the finds include the skeletons of Sicilian dwarf elephants), or the city art gallery or maybe just shopping or enjoying an ice-cream in spectacular Piazza Duomo. Evening meal. Overnight in Ortigia, Siracusa. We make an early start, driving through a landscape of rolling meadows and drystone walls that will be familiar to fans of Inspector Montalbano. Much of the Eastern part of Sicily was completely destroyed in an earthquake in 1693 and the towns and churches were subsequently rebuilt in a flamboyant style characteristic of Sicilian Baroque. Noto, indeed, was even rebuilt as a completely new city 15km from its original site and has a homogeneity and regularity of street-pan unrivalled in Sicilian architecture. Our journey then takes us to Modica for lunch, and there is time afterwards to enjoy the spectacular view of the city, dominated by the magnificent church of San Giorgio. We then continue our journey westwards to Ragusa Ibla. Ragusa was also rebuilt after the 1693 earthquake, but in this case, it is the old part of the town that we visit. We take a stroll through the winding streets of Ragusa Ibla before continuing our journey. In the late afternoon, we make a short stop-off at the Ponte Dirillo – the site of one of the fiercest battles in the Allied landings in Sicily. Here, the farmer has excavated the German bunkers and we get a sense of the terror that must have been unleashed on the Allied soldiers on the night of 10th July 1943. Our accommodation is just a 15 minute drive from the Ponte Dirillo, in a winery belonging to one of Sicily’s most important wine producers. Before dinner, we are treated to a wine tasting and a talk on the background to some of Sicily’s wines. Evening meal and overnight in a winery near Vittoria. We make an early start from the winery and drive to the Roman Villa del Casale at Piazza Armerina (1 hour) – a hunting lodge from Roman times endowed with the some of the most incredible Roman mosaics anywhere, quite breathtaking in their scope and in the imagery they portray. After lunch nearby, we drive to Agrigento (1.5 hours) and check in to our hotel. There is time in the afternoon to relax and perhaps catch up on your background reading on Sicily or writing postcards to your friends. Evening meal and overnight near Agrigento. This morning we venture among some of the finest Greek temples in the whole of the Mediterranean. We walk the whole stretch of the Valle dei Templi, starting with the beautiful Temple of Hera, moving on to the breathtaking Temple of Concordia – perfectly preserved and beautifully sited with fine views over almond groves and the sea and onwards until we reach the Temple of Zeus – the largest Doric temple ever built. We travel onward to Selinunte (1 hour) for lunch before visiting the archaeological site. This, the westernmost Greek colony in Sicily, was frequently at war with the Carthaginians, but nevertheless, expounded even greater archaeological riches than other Greek settlements in Sicily. The so-called “Temple E” closely rivals the Temple of Concordia as being the most impressive in Sicily, whereas the ruins of “Temple G” will astonish with their evident ambition. After our visit with travel onwards to a wonderful baglio or Sicilian manor farm, near Marsala where we stay the night. Evening meal and overnight near Marsala. We start the morning in Marsala or Marsa Allāh (God’s harbour) as it was known to the Arabs. Marsala has earned its place in Italian history books as being the site where Garibaldi landed with his Thousand when he began his conquest of Sicily in 1860. Its history is also entwined with the stories of Nelson, and a handful of English wine merchants throughout the 19th century who made the name of Marsala synonymous with the wine we know today. We drive north to visit a series of atmospheric saltpans. Started by the Phoenicians, the salt industry of Western Sicily became one of the most prolific in the Mediterranean and was crucial to the preservation of the tuna caught off the west coast of Sicily. In the afternoon we visit the magical island of Mozia. Lying just a few hundred metres off the shore of Sicily and rising at its highest point to just a few metres above sea level, the island of Mozia was once the Carthaginian capital of Sicily – until its destruction by Dionysius in 379 BC. We start the day with a drive to Erice. Walking through the maze of cobbled streets that make up the medieval town of Erice, we pause to look into some of the most charming churches in Sicily, before arriving at the Castle – once the site of a statue Venus Ericina and home to an ancient fertility cult. From the ramparts of the castle we enjoy some spectacular views over the west of Sicily – Trapani, the salt pans, Mozia, Marsala. In the afternoon, we drive to Segesta (1 hour) to visit what is perhaps the most beautifully sited Greek temple in the world. After musing on its origins in this Elymian city, we move onward to Palermo. We stay in Palermo in the old home of Giuseppe Tomasi di Lampedusa author of The Leopard and dine in a nearby restaurant. We rise early and go shopping to the Capo market with a Sicilian Duchess (and descendent of Lampedusa), choosing the food we will eat for lunch. Once we have finished shopping, we join the Duchess in preparing lunch – which we consume in aristocratic Palermitan splendour – in the company of her husband and in dining room once used by the Leopard himself. After lunch we a treated to a tour of Lampedusa’s study and drawing room. The rest of the afternoon, you are free to either relax or to stroll the streets of Palermo – perhaps visiting the Botanic gardens or the Piazza Marina. This evening you are free to dine as you wish. Overnight in the apartments of the old home of Giuseppe Tomasi di Lampedusa. We drive the short distance to the Cathedral of Monreale (30 mins) – one of the greatest extant examples of Norman architecture in the world. According to legend, in 1174, the Madonna appeared before the young Norman King William II and led him to a spot where his father had buried a considerable treasure. She instructed him to put it to good use and hence William founded this startling religious monument, high above the fertile Conca d’Oro. It was finished in less than ten years and a bustling medieval village soon sprang up around it. After visiting the cathedral of Monreale, we descend into the city of Palermo. Palermo is everything you would imagine it to be – chaotic, noisy, exotic, colourful. But the rewards of taking time to explore this incredible city are enormous. Indeed, we would go as far as saying that no visit to Sicily is complete without it. Founded by the Carthaginians, its history is as old as the island – but most of what we are in Palermo to see, dates from the Norman period and later. We visit the Norman Palace and the Palatine Chapel – surely one of the wonders of Norman architecture anywhere in the world – with its incredible juxtaposition of Byzantine mosaics and beautiful arab paintings in the ceiling. In the afternoon we visit some of the “Serpotta” churches and the church of the Martorana. We leave Palermo and drive (1.5 hours) to the town of Castelbuono, where several scenes of the film Cinema Paradiso were shot. 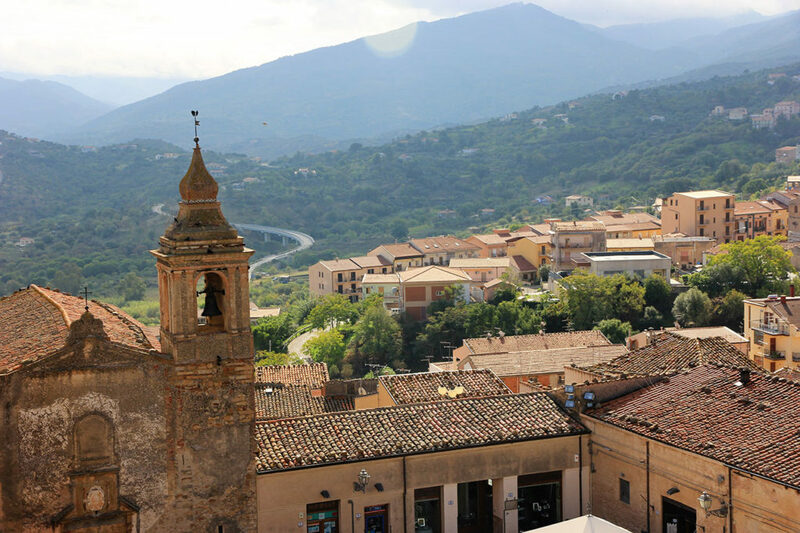 We then drive onward through the beautiful Madonie mountains to one of our favourite lunch spots, before descending to the coast once again to the town of Cefalù where we visit the splendid Norman cathedral and the beautiful medieval town. After our visit to Cefalù, we travel onward to Milazzo. We eat in a local restaurant and stay in Milazzo. Every Italian schoolchild knows the importance of Milazzo in their country’s history. It was the scene of the decisive battle in the Risorgimento which saw Garibaldi’s red-shirts defeat the Bourbons and lead the way to the unification of Italy. Though there little is left of the scene of the battle, the recently-restored castle in Milazzo (one of the largest in Europe) is one of the lesser-known wonders of Sicily. We spend a pleasant couple of hours in the early morning visiting this castle. After a picnic lunch, we drive to Taormina (1 hour) which is justifiably famous as one of the most splendid locations in Sicily. After settling in to the hotel there will be an opportunity to visit the splendid Greek theatre. In the later afternoon you have free time to stroll through the corso of Taormina and enjoy the rest of the afternoon as you wish. Free evening and overnight in Taormina. For those who wish, in the morning, we explore the slopes of Mount Etna, hearing about the fascinating geology of this, the highest volcano in Europe. There is an opportunity to take the cable car and jeeps to within 300m of the summit (ticket not included in the tour price). We return in the early afternoon to Taormina when there will be free time to enjoy the town or the swimming pool at the hotel. Farewell dinner in a local restaurant. Overnight in Taormina. We travel back to Catania airport (1 hour) from whence we say our goodbyes and depart. For those whose travel is not until the evening, it is possible to enjoy a free day in Taormina – perhaps relaxing by the pooling or strolling the corso until it is time to drive to the airport. Please note: this is the standard itinerary, but individual tour programmes may differ slightly to take account of local festivals, closing times and availability.